Financial incentives are widely used strategies to alleviate poverty, foster development, and improve health. Cash transfer programs, microcredit, user fee removal policies and voucher schemes that provide direct or indirect monetary incentives to households have been used for decades in Latin America, Sub-Saharan Africa, and more recently in Southeast Asia. Until now, no systematic review of the impact of financial incentives on coverage and uptake of health interventions targeting children under 5 years of age has been conducted. The objective of this review is to provide estimates on the effect of six types of financial incentive programs: (i) Unconditional cash transfers (CT), (ii) Conditional cash transfers (CCT), (iii) Microcredit (MC), (iv) Conditional Microcredit (CMC), (v) Voucher schemes (VS) and (vi) User fee removal (UFR) on the uptake and coverage of health interventions targeting children under the age of five years. We conducted systematic searches of a series of databases until September 1st, 2012, to identify relevant studies reporting on the impact of financial incentives on coverage of health interventions and behaviors targeting children under 5 years of age. The quality of the studies was assessed using the CHERG criteria. Meta-analyses were undertaken to estimate the effect when multiple studies meeting our inclusion criteria were available. Our searches resulted in 1671 titles identified 25 studies reporting on the impact of financial incentive programs on 5 groups of coverage indicators: breastfeeding practices (breastfeeding incidence, proportion of children receiving colostrum and early initiation of breastfeeding, exclusive breastfeeding for six months and duration of breastfeeding); vaccination (coverage of full immunization, partial immunization and specific antigens); health care use (seeking healthcare when child was ill, visits to health facilities for preventive reasons, visits to health facilities for any reason, visits for health check-up including growth control); management of diarrhoeal disease (ORS use during diarrhea episode, continued feeding during diarrhea, healthcare during diarrhea episode) and other preventive health interventions (iron supplementation, vitamin A, zinc supplementation, preventive deworming). The quality of evidence on the effect of financial incentives on breastfeeding practices was low but seems to indicate a potential positive impact on receiving colostrum, early initiation of breastfeeding, exclusive breastfeeding and mean duration of exclusive breastfeeding. There is no effect of financial incentives on immunization coverage although there was moderate quality evidence of conditional cash transfers leading to a small but non-significant increase in coverage of age-appropriate immunization. There was low quality evidence of impact of CCT on healthcare use by children under age 5 (Risk difference: 0.14 [95%CI: 0.03; 0.26]) as well as low quality evidence of an effect of user fee removal on use of curative health services (RD=0.62 [0.41; 0.82]). Financial incentives may have potential to promote increased coverage of several important child health interventions, but the quality of evidence available is low. The more pronounced effects seem to be achieved by programs that directly removed user fees for access to health services. Some indication of effect were also observed for programs that conditioned financial incentives on participation in health education and attendance to health care visits. This finding suggest that the measured effect may be less a consequence of the financial incentive and more due to conditionalities addressing important informational barriers. Financial incentives are becoming widely used policy strategies to alleviate poverty, foster several aspects of development, and improve the health of populations. It has also been recommended as an important strategy to reduce barriers to access to health care  and, more often than not, health gains are explicit objectives of these strategies . Microcredit [3–5], user fee removal policies , voucher schemes  and cash transfer programs [8–11] that provide direct or indirect monetary incentives to households, with or without activity or behavioral conditionalities, have been used for decades in Latin American [9, 12–14] and sub-Saharan African countries [15–19], and in Southeast Asian settings [20–24]. With an overarching goal of poverty alleviation, and an assumption that, in general, these policies will allow market mechanisms to help people overcome poverty, many complex and expensive programs have been implemented on a very large scale in some countries [7, 10, 25–27]. More often than not there is an expectation that care, uptake and coverage of health interventions, and ultimately health status, will improve as a consequence of such programs and policies [18, 24, 28–30], as the poorest sections of the population most often face the greatest barriers to accessing health services . In most instances, these are financial barriers ; hence, removing such impediments should lead to an increase in the uptake of health interventions and care seeking in case of illness. Evaluations of large programs have shown a dose-response effect of the amount of money received on health status , suggesting it may act independently of the conditionality. In addition, many of these programs are conditional on school attendance [9, 12, 31], participating in health education activities [32–34], taking children to preventive health-care visits [9, 25, 31] and keeping vaccines up-to-date [7, 10, 12, 13, 25], which should improve health status. Some other programs offer health education activities [22, 33, 34] or streamline participants’ access to health care  in addition to the financial benefit offered, thereby addressing informational as well as financial barriers, but in many cases participation in such activities is not a condition for receiving the financial benefit. Although previous systematic reviews and overviews [1, 35–37] have addressed the impact of different types of financial incentive programs on health, no comprehensive systematic review has been conducted on the impact of a broad range of financial programs implemented in low- and middle-income countries on coverage and uptake of health interventions and behaviors targeting children under five years of age. The objective of this review is to provide estimates of the effect of six types of financial incentive programs on the uptake and coverage of such health interventions: (i) Unconditional cash transfers, (ii) Conditional cash transfers, (iii) Unconditional microcredit, (iv) Conditional microcredit, (v) Unconditional voucher (vi) Conditional voucher and (vi) User fee removal. These interventions are described in Table 1. Monetary transfers to households or individuals without pre-imposed conditionalities. Monetary transfers to households or individuals conditional on the recipient adopting and maintaining certain behaviors prescribed by the cash transfer program. Small loans offered to borrowers (usually lacking employment or credit history) without imposing conditionalities other than re-payment of the loaned amount. Small loans offered to borrowers (usually lacking employment or credit history) conditional on the recipient adopting and maintaining certain behaviors prescribed by the program in addition to re-payment of the loaned amount. Indirect monetary transfer given by issue of coupons, vouchers, electronic card transfer or other method used to purchase commodities from local shops or outlets. Indirect monetary transfer given by issue of coupons, vouchers, electronic card transfer or other method used to purchase commodities from local shops or outlets conditional on the recipient adopting and maintaining certain behaviors prescribed by the voucher program. Total or nearly total (75% or more) removal of user fees for accessing heath services. * No unconditional voucher programs were included in this study. We systematically reviewed all studies published up to September 1st, 2012 to identify studies with data assessing the impact of financial incentives on access to child health interventions using the Child Health Evaluation Reference Group (CHERG) systematic review guidelines . We conducted the initial search in March 2012 and updated searches on July 2012 and September 2012. The searches were completed using OvidSP to scan the Pubmed, EMBASE and AMED databases. We used all combinations of the following key search terms: Cash transfer, voucher scheme, demand side financing, social transfer, voucher program. We purposely included broad categories as well as names of financial schemes identified through previous reviews, other databases and repositories. We included in our search variations of names and/or acronyms of the thirty-five programs we identified in previous publications [1, 2, 17, 18, 28, 35, 39–41]. In addition, we searched variations of the terms microcredit, microfinance, micro-insurance, and economic empowerment, and limited the results of this search using variations of the terms evaluation or impact. To incorporate user fees, we adopted a previous review’s search strategy , and limited to children. Our search strategies are described in detail in Additional File 1. We included randomized controlled trials (RCT), cluster randomized controlled trials (cRCT) and observational studies reported either in peer-reviewed journals or in institutional or commissioned reports that assessed the impact of financial incentive programs on health interventions targeting children under the age of five. (e) Other preventive health interventions (preventive deworming, vitamin A and iron supplementation). A detailed description of the outcomes included in this review and the definitions used is presented in Table 2. * In the case of cross-sectional studies, the effect measure was calculated assuming no change in control group and that the baseline value for the intervention group as equal to that of the control group. ** When reporting period is different this is noted as a limitation in the quality assessment table. We abstracted all available data in duplicate for each of the outcomes and financial incentives described above We presented effect measures as mean risk differences-in-difference and their 95% confidence intervals. All analyses were done, using RevMan 5 (Cochrane Collaboration). After removing duplicates, our searches yielded 1,567 titles. To ensure identification of all relevant literature, we scanned the references of all relevant articles identified through our searches. To complement our formal search strategy, we conducted a number of searches in Google Scholar. For these searches we used the names of identified conditional cash transfer, unconditional cash transfer, voucher-scheme, microfinance and food stamp programs combined with the terms evaluation and health and the country in which the program was carried out. Results were sorted by relevance and the titles and abstracts of the articles in the first ten pages of results were scanned for inclusion. In cases where titles and abstracts were not in English, titles and abstracts were translated using Google Translate. In cases where search results were obviously irrelevant, titles and abstracts were only scanned for the first five pages of results. Articles that had previously been found through the formal search strategy were not pulled again. A total of 78 Google Scholar searches were performed, in which 99 articles were identified as satisfying initial inclusion criteria. We also searched the Microfinance Gateway library and screened all publications relating to the terms health and nutrition. Of the 1,666 screened in duplicate based on titles and abstracts, 1,527 articles were excluded as obviously irrelevant. We thoroughly reviewed 139 full publications identified through our searches as well as an additional five articles that were located through scanning references of relevant articles, also in duplicate. We excluded 119 of these articles based on criteria defined a priori, either because they contained duplicate data to one of our included studies, did not include an eligible financial intervention, did not have a comparison group or relevant outcomes. In the end, 25 studies were included [7, 8, 10, 15, 16, 21–23, 25, 26, 33, 34, 40, 42–53]. Figure 1 is a schematic representation of our search. Flow diagram showing identification of included studies. Just under half the studies were institutional reports and thus were not peer-reviewed [8, 10, 25, 33, 34, 43, 45, 47–50]. Only 36% of the studies were randomized trials. Of the 25 studies, 13 were in South America or the Caribbean [7, 8, 10, 25, 26, 34, 43–45, 47–49, 51], 8 were in Africa [15, 16, 33, 40, 42, 50, 52, 53] and 4 were in South East Asia [21–23, 46]. 48% of the studies evaluated cash transfer programs: 41% evaluated conditional cash transfer programs and 7% evaluated unconditional cash transfer programs. 22% of the programs evaluated the effects of removing user fees. One quarter of the studies evaluated microcredit programs. Almost half of the programs evaluated (48%) had a conditional component relating to health. For details of each study, see Additional file 2. We present forest plots only for selected outcomes. Additional file 3 presents forest plots for all study outcomes. The overall quality of evidence for the effect of financial incentives on breastfeeding practices was low, mainly due to the limited number of relevant studies available (Table 3). The pooled estimate from two studies suggests that conditional microcredit programs produce an average 22% net increase in the percentage of newborns receiving colostrum (MD=0.22; CI: 0.08 to 0.35) compared to control (Figure 2). 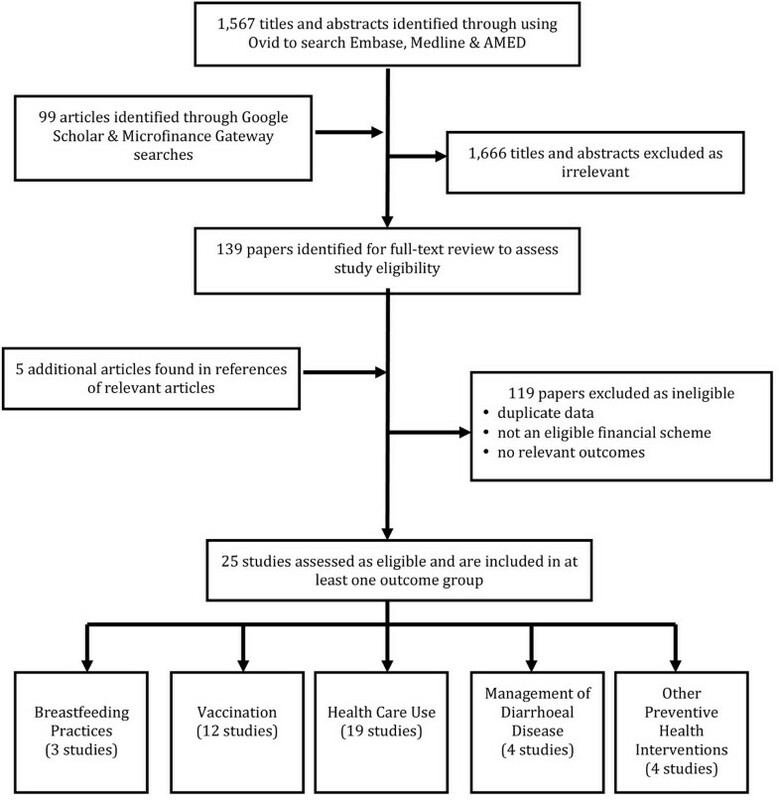 Evidence from another two microcredit studies suggests no statistically significant effect of either conditional (MD=-0.01; CI: -0.03 to 0.02) or unconditional (MD=-0.06; CI: -0.16 to 0.04) microcredit programs on the prevalence of any breastfeeding among children under two years (Table 3). Estimates of the effect of financial incentive programs on early initiation of breastfeeding and the prevalence and duration of exclusive breastfeeding (measured in months) among children under six months are based on single studies that were published as non-peer-reviewed reports. In four of the six studies included in these analyses of breastfeeding practices, the financial incentives were conditional on mothers’ participation in health and nutrition education sessions that included breastfeeding promotion. Effect of financial incentives on percentage of newborns receiving colostrum. There is moderate or low quality evidence from conditional cash transfer and conditional microcredit programs indicating no significant effect of either of these types of financial incentive on the coverage of BCG, DPT-1, DPT-3, measles or polio vaccination or on the coverage of any vaccination (Table 4). Financial incentives in many of the studies included in these analyses were conditional on children attending preventive healthcare visits that included vaccination (Table 4). However, moderate quality evidence compiled from four studies suggests that conditional transfer programs may increase coverage of full, age-appropriate vaccination (MD=0.05; CI: -0.01 to 0.10), but this pooled estimate is not statistically significant (Figure 3). Estimates of the vaccination coverage effects of unconditional cash transfer or unconditional microcredit programs, or of conditional voucher schemes, are based only on single studies, some of which were published as non-peer-reviewed reports. Analysis of cRCT does not account for clustering. Effect of financial incentives on percentage of children receiving their full EPI vaccine schedule. The pooled analysis of five studies evaluating the impact of conditional cash transfer programs on the prevalence of preventive health care use by children shows an average 14% net increase among program participants compared to non-participants (MD=0.14; CI: -0.00 to 0.29) (Figure 4). The evidence is inconsistent across studies however, even though the financial incentives in four of the five programs were conditional on preventive health visit attendance, and the overall quality of this evidence is low given the variability in study designs, and because only one study was reported in a peer-reviewed publication (Table 5). Even more pronounced effects were observed for user fee removal on the prevalence (MD=0.33; CI: 0.24 to 0.43) and on the frequency (MD=0.99; CI: 0.71 to 1.27) (Table 5) of curative health care use, but the overall quality of the evidence for these effects was also low, with the pooled estimates based on only two studies each, none of which were randomized. Large and statistically significant effects of user fee removal on the frequency of other types of child health care visits were also shown in several individual studies, but these single study estimates yield low quality evidence only. Effect of financial incentives on percentage of children accessing preventive health care in the previous 6 months. The overall quality of evidence for the effect of financial incentive programs on diarrhoea management outcomes was low, with only single studies of unconditional or conditional microcredit programs reporting on the use of oral rehydration solutions or on care-seeking during diarrhoea (Table 6). Two studies of conditional microcredit programs reported on the practice of continuing child feeding during diarrhoea, with the pooled estimate suggesting no effect of this type of financial incentive on this outcome (Table 6) despite the conditionality of mothers’ attendance of health and nutrition education sessions to qualify for microcredit in both studies. 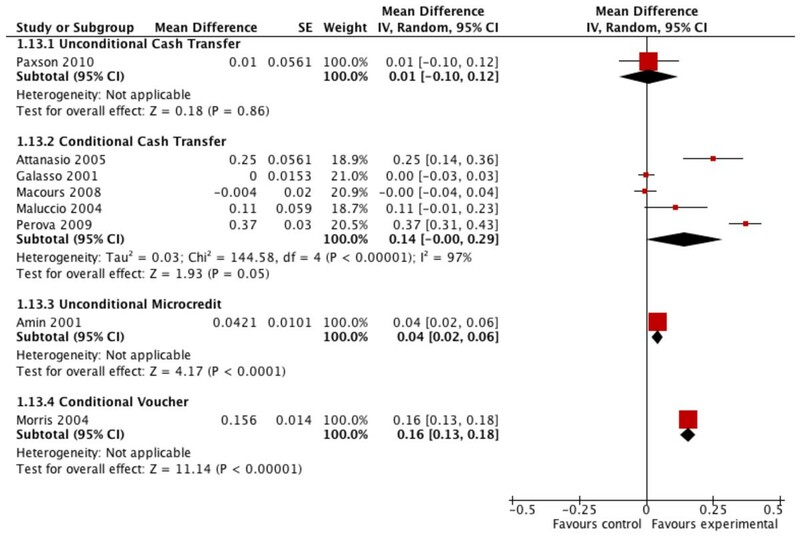 All available evidence for the effects of financial incentives on other preventive health practices come from randomized or cluster randomized studies of unconditional or conditional cash transfer programs (Table 7). However, only single studies report on deworming and iron supplementation, yielding low quality evidence for these outcomes. Moderate quality evidence pooled from two randomized studies suggests that conditional cash transfer programs may increase the coverage of vitamin A supplementation (MD=0.16; CI: -0.01 to 0.34), but this pooled effect estimate is not statistically significant (Table 7). The conditionality attached to only one of the two conditional cash transfer programs was health-related, but this conditionality was not monitored. The apparent appeal of financial incentives is based in part on the underlying assumption that these programs will impact child health. Because there were indications of impacts on some child health outcomes , we hypothesized that improved access to health care and increases in coverage of child health interventions must be important components of the pathway from the implementation of financial incentive programs to child health gains. However, our main finding is that there is no high or moderate quality evidence to support this hypothesis. Our results reveal that the evidence for an impact of financial incentive programs on the coverage of a broad range of health interventions among children under five years is generally limited and of low quality. Although evidence on a few specific outcomes may be at maximum moderate, there is only low quality evidence of an effect of financial incentives on the groups of outcomes studied: breastfeeding practices, preventive deworming, health care use in case of illness and preventative health care use. Reduction or elimination of user fees is one of the few interventions that had very large effects in the use of health services. Although the quality of the evidence is also low, the pronounced effects that were observed for user fee removal on health care use deserves attention. Nevertheless, it should be noted that one study observed a negative effect of generalized user fee removal policies on service use by children and pregnant women . Such effect may be explained by difficulties of the health services in meeting increased demand, and further research is needed to clarify this association. The role of conditionalities is one of the most important aspects to be addressed when evaluating the impact of financial incentive programs on health. Even in the limited number of studies in our review, it appears that conditioning financial incentives on health-related behaviors significantly influences program effect. It is challenging to attribute the health effects of conditional financial incentive programs to the monetary component because, theoretically, conditionality may be confounding this effect and also because programs are not designed to allow its evaluations to separate the effects. Among the studies included in our review, in most cases the conditionality is related to participation in health activities that are directly related to the health outcome of interest. It has been previously noted that these health education or knowledge-transfer activities do increase coverage of interventions , therefore it is not surprising to notice that in our results all the positive effects observed for the group of breastfeeding outcomes, for example, come from programs that were conditional on women’s participation in health and nutritional education activities, all of which had a strong emphasis on breastfeeding promotion (Table 3). Similarly, the effect of conditional transfer programs on the coverage of full, age-appropriate vaccination, even though not statistically significant, is based on the pooled results of four studies, three of which were conditional on the participant maintaining vaccines up to date. To strengthen this point, four of the five studies evaluating the impact of conditional cash transfer programs on preventive health care use were conditional on children attending preventive health care services routinely. Under such circumstances, it may be surprising that the pooled analysis yielded only a moderate 14% net increase among program participants. This difficulty in interpreting results of conditional financial incentives has been noted in a previous discussion about financial incentive programs , and indeed, isolating the effects of financial and non-financial program components is a daunting but necessary task that should be incorporated in the design of future evaluations of such programs. The quantitative evidence for an effect of financial incentives and policies on the coverage of child health interventions presented here does not support the positive findings of earlier qualitative assessments of such programs [18, 35]. Because the evidence is currently limited and of low quality, we plan to conduct systematic updates of this analysis as new studies and evaluations of such interventions become available. In addition, a similar exercise to systematically evaluate the evidence of the impact of such programs on other aspects of child health and development, such as morbidity and mortality, is warranted. ZAB conceived of the study; DGB, PA, KW and ZAB wrote the protocol; KW conducted the literature searches, and abstracted the data with PA and DGB. KW and LL assessed study quality, with DGB and MFG resolving discrepancies; DGB and MFG analyzed the data and wrote the first draft of the manuscript; all authors revised the draft and approved the final manuscript.